I've been gaining weight. I know there are lots of reasons for it, but I hate it. I hate that I don't have clothes that fits, I hate that I just don't want to go out because I feel awkward. I'm tired. And I'm tired of being tired. 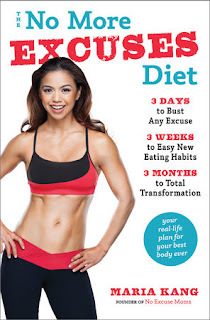 The No More Excuses Diet by Maria Kang was one of those spur of the moment decisions on my part, where I just know I need something to help push me, and if I have to write a review, so much the better. Don’t let excuses stop you from having a body and a life that you love! We all know that we should exercise and eat right, so why is it so hard to follow through? We make excuses for why we aren’t taking better care of ourselves, saying things like, “I’m too tired,” “I don’t have time,” or “I’m just not built to look that way.” But Maria Kang, the mother of three behind the viral “What’s Your Excuse?” mom photos, is here to say that the excuses stop now. This is a picture I could have taken when I had three boys. I was in great shape, and I was a dozen or more years younger than I am know. I see myself in her. I really like her. And she clearly does know her subject. What I do appreciate about the book is that Kang isn't some totally idealistic, everything-can-be-perfect type of person. She spells out that real life will get in the way of the best laid plans, but that doesn't mean you totally give up. Her diet plan is reasonable. Her exercise plan is reasonable. She makes sense. And I love all the photos she has for the exercises. I would have completely loved her ideas and her plan thirteen years ago. This would have pushed me to lose those last fifteen pounds. Right now, it is motivating me to do something, and to some extent that even involves following her suggestions. Just not quite as all-out as she suggests.